WARNING: Please be aware that these are photos of the teeth of a deceased rat. 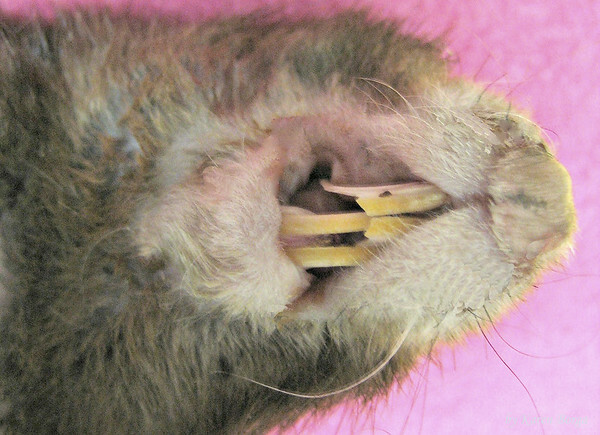 The problem tooth was discovered only after the rat was euthanized after a long illness. This astonishing long, curved tooth grew independently of his regular teeth which always appeared normal. Brief checks of his teeth during medical exams never revealed this hidden tooth which grew into a long, curved tusk shape that at the end was just about to penetrate the upper mouth. The importance of showing this sweet rat's tooth is that quick looks at your pet rat's teeth may not reveal problems. 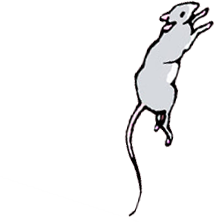 If your rat is squirmy and doesn't like his teeth examined, consider working with him to tolerate an exam that opens and pulls back the gums for an in-depth visual exam.